It seems I’ve made a tradition of going to River Jam in New Braunfels and immediately after, headed straight for Colorado with the family. I’m back and only now had the chance to reflect on what went down. Here’s my River Jam by the bullets. Garrett Bryan and Buffalo Ruckus were a great way to kick off the weekend. We’ve given ample attention to both recently, go read about them. The river didn’t have much to give us this year but we stayed wet in the Texas heat, sucking down drinks and bonding with friends before heading to River Road Icehouse. Austin Meade showed how he’s coming into his own in this scene. 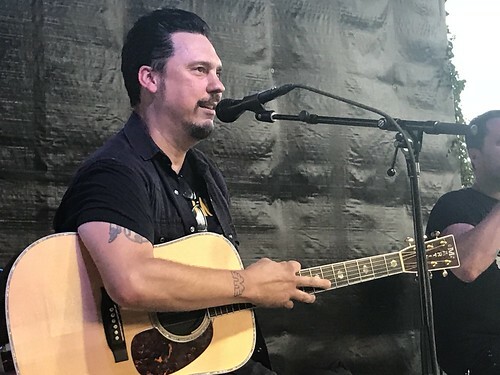 Jesse Dayton was as Fonzie cool as one can imagine. I was waiting for the biker contingent to arrive but it didn’t happen. Jamie Lin Wilson beat the heat and did her show +1 with baby on board. Zac Wilkerson closing out the night with that soulful voice was something to behold. The Mayor of Funville seems to approve. Sunday continues to be my favorite day, lots of artists and lots of opportunities for special moments. 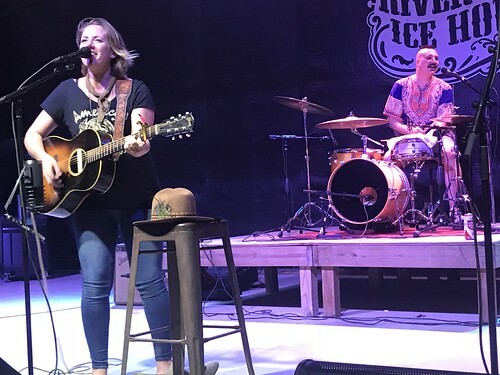 Having Coby Wier, son of the great Rusty Wier, close out River Jam with “Don’t It Make You Want To Dance” was pretty darn cool. After the official festivities ended we took the party down to the river, where Mark Allan Atwood, Mike Stanley, Coby Wier, and others joined us for late night river jamming. I’m ready for next year. You should join us. My family has been homeless for the past month. Our house in Lewisville sold in a couple of days and the original plan was to move to the Hill Country. It’s been a rollercoaster and plans have changed. We’ve purchased some lakefront property in Granbury, the land of Larry Hooper. We are going to build, and my wife is drafting the house plans as I write. In the meantime, we will be with family, just minutes down the road hoping not to wear out our welcome. A couple of weeks back, I took my brother to a Galleywinter Listening Room event to see Walt Wilkins play in John Dempsy’s living room. A fantastic evening for sure. On the way home, the music and culture editor for The Dallas Observer cold called me on Facebook and asked if I wanted to write for them. I took the gig, but will still be doing my thing here because I love the people and the institution that is Galleywinter. I’ll mostly be covering shows and venues for The Observer with the occasional interview mixed in. They already asked if I wanted to cover a Jason Aldean show, I told them no. I have no idea if the Cowboys or the Aggies are going to be any good this season. Last year excluded, A&M is really good at going 5-0, giving us false hope, then getting buzz-sawed by the big boys in the SEC. With a new head coach, it should be interesting, to say the least. Fort Worth’s Dan Johnson is still gaining his footing as a reputable singer-songwriter in these parts. Over the last 18 months, he’s moved in the right direction for sure, surrounding himself with folks that have been in the game for a while and doing it right. These days you’ll find Johnson at his recurring “Almost Famous” gig at Love & War in Plano, song swapping with the likes of Josh Grider, Drew Kennedy, and Ben Danaher. We also covered this collaboration with his hero, Walt Wilkins. That’s some good company, and Dan Johnson is about to showcase all he’s learned with a very personal and ambitious project.